Falls are the number one cause of workplace fatalities for construction workers, and up to five construction workers are killed each week due to fall injuries. 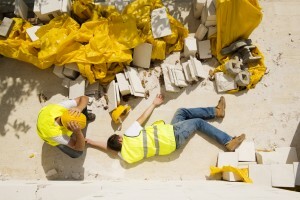 Falls are reportedly the number one cause of workplace fatalities for construction workers. Up to five construction workers are killed each week due to fall injuries. Most of these fall-related fatalities are the result of the fact that injured workers sustained some type of severe head and brain injury due to the fall. Nearly 67 percent of fall injuries sustained by construction workers are related to slips and falls from ladders. While some fatal falls reportedly occur from heights of less than 6 feet, nearly 50 percent of all deadly falls occur from heights of 20 feet or less. Nearly 75 percent of all fatal falls occur from roofs, ladders and scaffolding. More than 25 percent of all construction-related injuries are fall injuries. While falls on the same level are a major source of work injuries (but do not cause as many fatal injuries), falls from roofs and ladders (i.e., a height, rather than the same level) are a major source of fatal injuries (as opposed to non-fatal injuries). Clearly, falling and the resulting injuries are a significant concern for the construction industry, and industry leaders should concentrate on what they can do to prevent such falls in order to protect construction workers, improve workplace safety and, ultimately, to save workers’ lives. Be sure to check out the upcoming Part 2 of this blog for safety tips that can reduce the risk of serious fall injuries at construction sites.